In the Shadow of Your Wings comments on select Bible passages, explaining their meaning and how they can be applied to the current scene. The books of Psalms, Joshua, Luke, Jeremiah, and others are included. - Publisher "Righteousness from rescue, rescue in the place of praise and adoration -- these are the contexts to which the Bible, the basis of the lives of Jews and Christians, belongs." This insight, drawn from reflection on Psalm 36, forms the central hub around which the essays collected in this book turn. 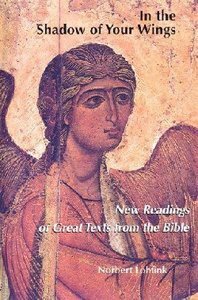 Though focused on individual texts from the Hebrew Bible, all the chapters, originally public lectures, seek to draw the reader into the movement from a mysticism of human introspection to a mysticism of the presence of God in the world and society. Book jacket. - Publisher In the Shadow of Your Wings coments on select Bible passages, explaining their meaning and how they can be applied to the current scene. The books of Psalms, Joshua, Luke, Jeremiah, and others are included. In the eighth chapter of this book Lohfink interprets Psalm 36, the inspiration for the title "In the Shadow of Your Wings," which focuses on a movement from a mysticism of human introspection to a mysticism of the presence of God in the world and society, In this collection of essays Lohfink suggests that righteousness from rescue, rescue in the place of praise and adoration - the themes of Psalm 36 - are the context to which the Bible, the basis of the lives of Jews and Christians belongs. About "In the Shadow of Your Wings"
"Righteousness from rescue, rescue in the place of praise and adoration -- these are the contexts to which the Bible, the basis of the lives of Jews and Christians, belongs." This insight, drawn from reflection on Psalm 36, forms the central hub around which the essays collected in this book turn. Though focused on individual texts from the Hebrew Bible, all the chapters, originally public lectures, seek to draw the reader into the movement from a mysticism of human introspection to a mysticism of the presence of God in the world and society. Book jacket. In the Shadow of Your Wings coments on select Bible passages, explaining their meaning and how they can be applied to the current scene. The books of Psalms, Joshua, Luke, Jeremiah, and others are included. In the eighth chapter of this book Lohfink interprets Psalm 36, the inspiration for the title "In the Shadow of Your Wings," which focuses on a movement from a mysticism of human introspection to a mysticism of the presence of God in the world and society, In this collection of essays Lohfink suggests that righteousness from rescue, rescue in the place of praise and adoration - the themes of Psalm 36 - are the context to which the Bible, the basis of the lives of Jews and Christians belongs. Lohfink is Professor Emeritus of Old Testament at the Philosophisch-Theologische Hochschule Sankt Georgen in Frankfurt am Main, Germany. Linda M. Maloney is the translator of many works, including Norbert Lohfink's Theology of the Pentateuch (Fortress Press, 1995) and Gerd Theissen's The Gospels in Context (Fortress Press, 1992).